Another forum (sfcmac) member and I thought it would be fun to build some of the kits we had in our youth. 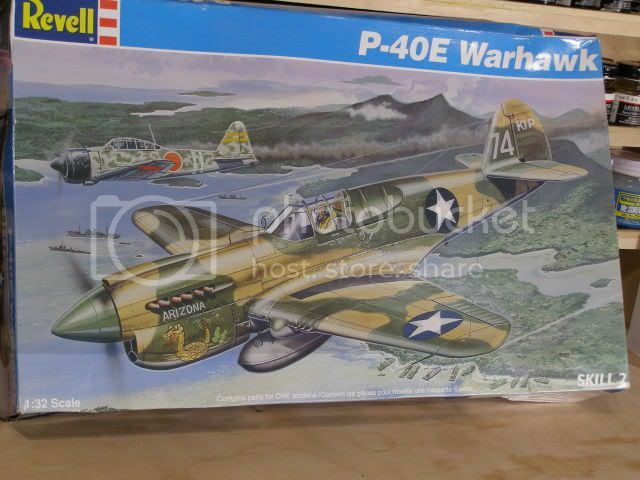 My kit choice was the P-40 E Warhawk that has been around since 1969 and seen many different box~art versions. This will be my attempt to improve on this kit with the aid of Squadron Reference Books ,scratch~building and a Eduard P/E set. The kit comes with many working options OOB to keep young minds busy. 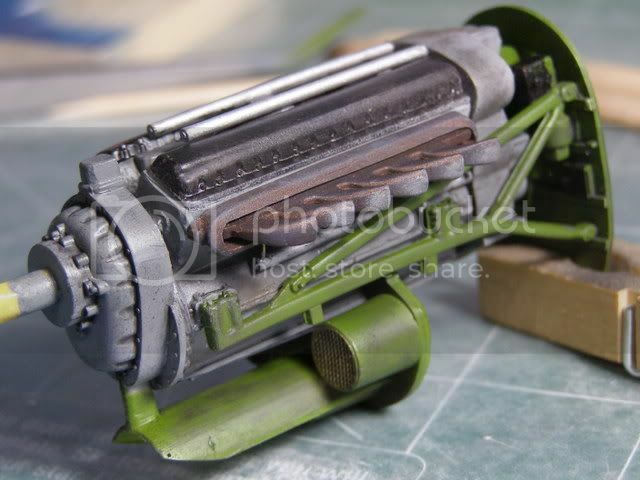 I will not be using most of them , but I did like the removable panels to show off the V-12 Allison engine. Even though most of it will be hidden I scratch built some details to dress up the firewall. 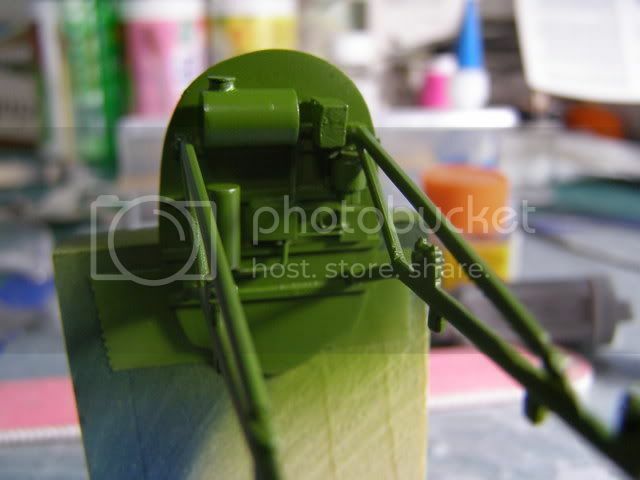 Painted with some wire added, the engine mounts in place. 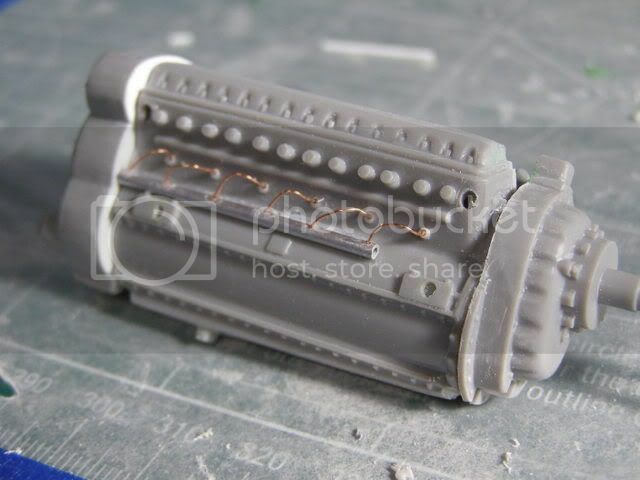 I used styrene to fill in the Gaping holes, along with aluminum tubing and fine copper wire for some extra detail. Eduard P/E makes the radiator grill covers. Next was the "office" here is what Revell supplies with the kit. Not bad, I was quite impressed with this added detail when I was 10 years old. But I think we can do better . 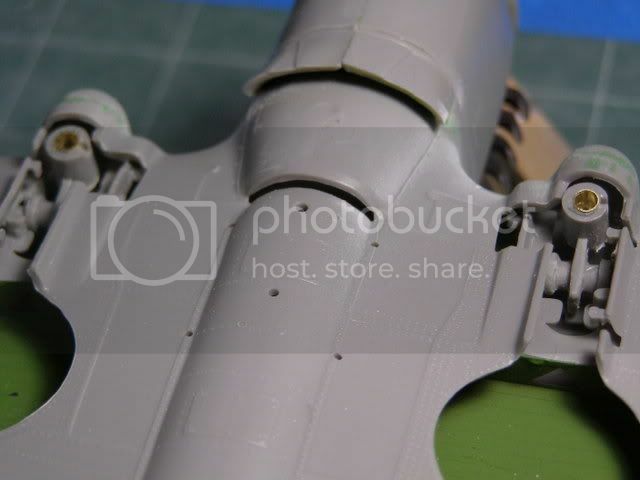 Using the Eduard P/E set for a starting point, I realized this was not going to look very nice on the shaped fuselage. Taping the fuse sides together and the kit supplied floor and bulkhead I used Post-it-notes to make patterns to box in the office. 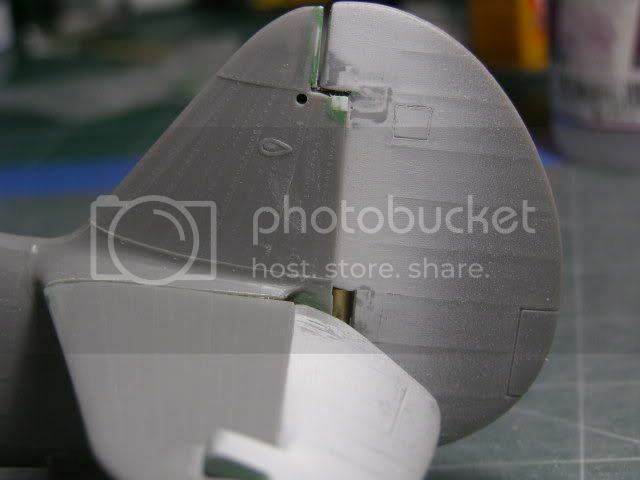 Styrene .030" sheet was used for the sides with lots of test fitting and double checking. This worked much better for the P/E ribbing. Starting to busy up the office with P/E seat, the Hydraulic hand pump was scratched out of tubing and wire with a blob of C/A glue for the knob. 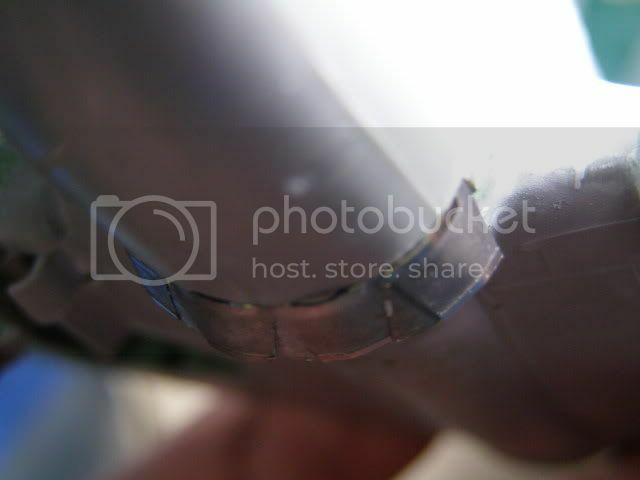 Sidewall with Eduard parts and scrap wire. I was much happier with this then the kit supplied part. Sean "I've reached nearly fifty years of age with my system." What a great start. You have done a perfect job on it. I have the "1941" version that I got off Ebay last year in my waiting-to-do stash. I have always wanted one since my brother had gotten the Aleutian Tiger for his birthday in 1970. PS, I just scored a 1/32 F80C. "I once shot an elephant in my pajamas. How he got in my pajamas, I`ll never know!" Great looking progress Sean! 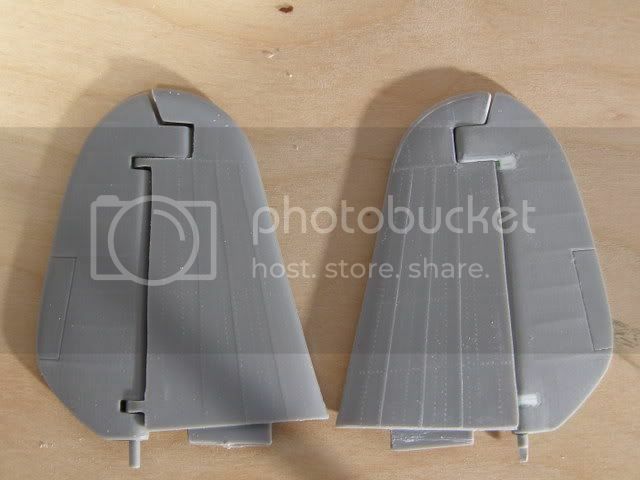 The difference between the kit sidewalls and the new and improved PE sure makes a HUUUGE difference. Your work is impeccable as always. Have you picked out any markings yet? Very nice work on the pit . Keep us posted as you progress. Sean, fantastic work there my friend. Excellent work Sean, that Sarge, sure has a lot to answer to LOL. ..'Your an embarrassment to the human genus, makes me ashamed to call myself Homo'. Great Stuff! 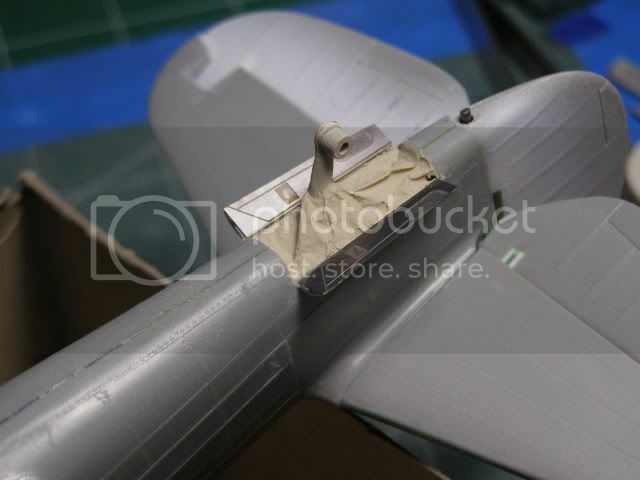 I am actually doing the same thing but for the Spitfire Mk I right now. 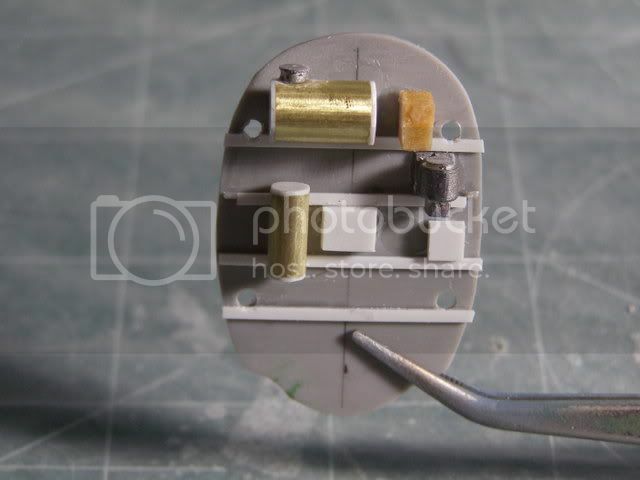 I plan do this with as many of the old revell kits as I have. I will post some pics of my spit build this weekend and we maybe we can share our progress if you don't mind. "When I want it to stick, I give it to 'em dirty"
stikpusher - Thanks, A lot of us cut our teeth on these type of kits. But I dont remember spending as much time building one back then. richs26- get that kit out and on the bench, 39 years has been long enough. Thanks for commenting. Roy - Thank you Now about your P-40 ? Guy - Could it be Aarons Fault this Time ? gspatton44 - Fantastic, these older kits are a blast. 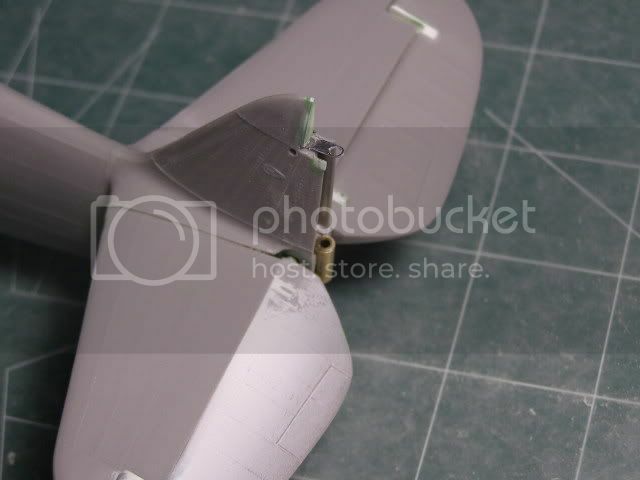 I have been having great time on this project as I have rediscovered my modeling skills instead of my assembling skills. 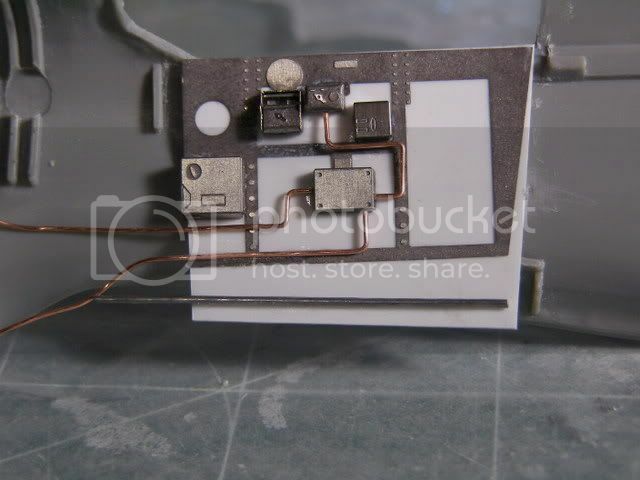 Eduard supplied a new IP, to use the kit supplied IP as a backing looked like too much work so once again .030" styrene was used for the upper and lower panel. I did use the Kit panel to copy the angle. I test fit this piece many times using Krystal Clear canopy cement to hold it in place. Starting to pick out the details on the completed panel. 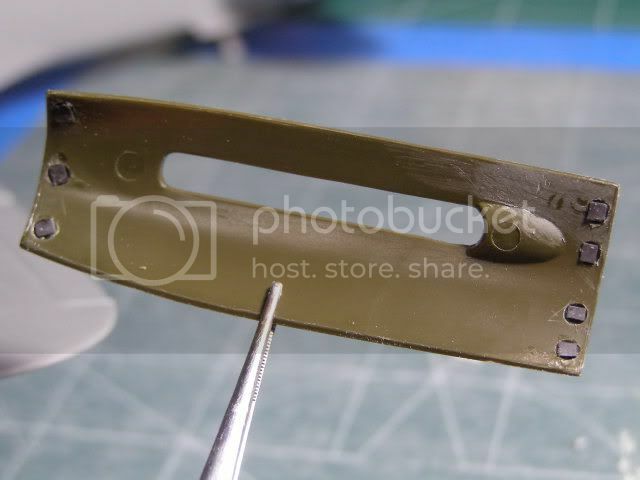 The scrap of sprue was C/A glued on the back for a handle . The fit was very good due to all the care taken with test fitting. 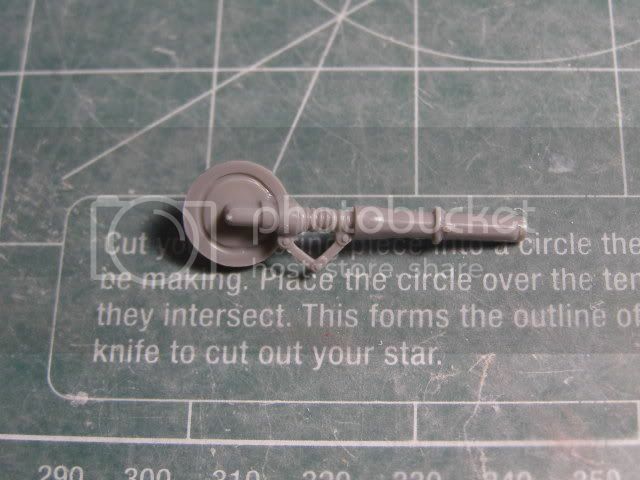 I sawed the sprue handle off leaving a stub so I could still have a holding spot with the tweezers. It was still tricky to get in position . 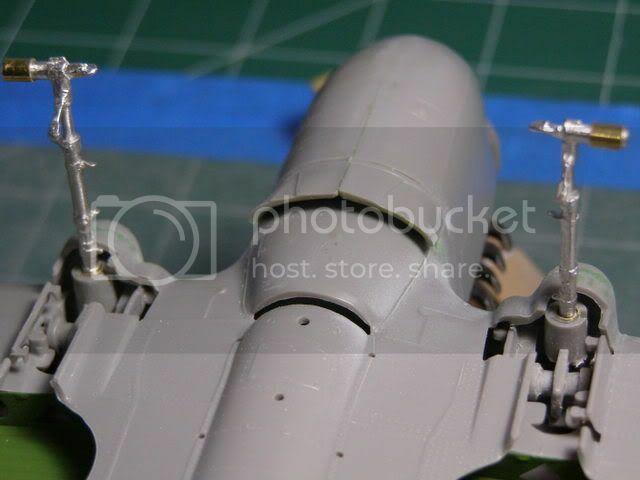 Next up was wings and things, P/E was used for wheel enclosure. 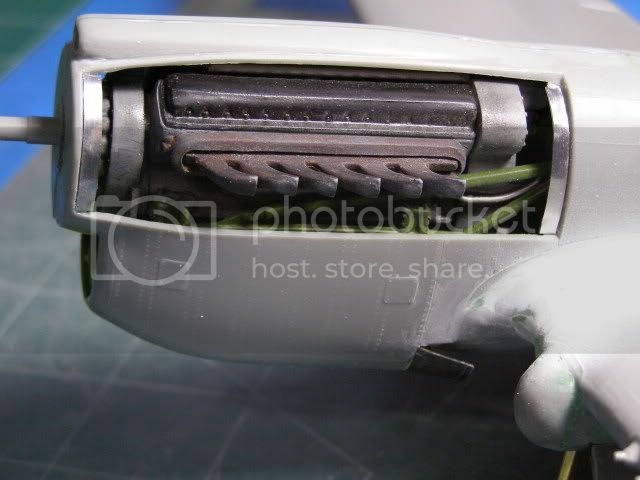 Looking at many references I noticed the shell ejector panels was lacking the bulge. Using the Squadron Books as reference I sketched out a pattern on paper then tranfered it to styrene. 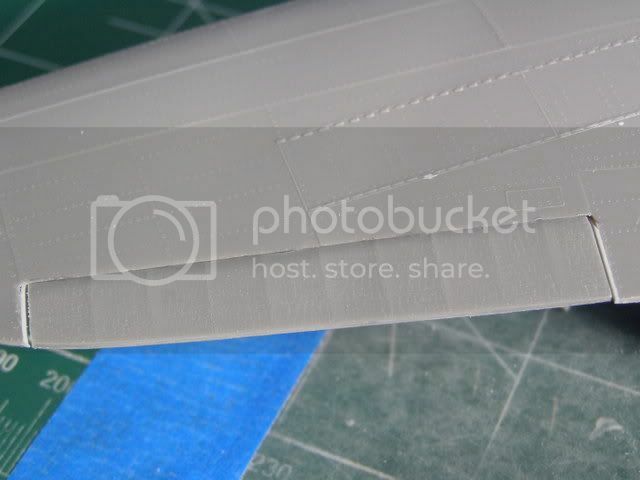 I even addes a styrene shim to fill in a low area towards the leading edge. After a little filler and shaping I also closed up the sliding canopy gap with a .020" styrene shim. 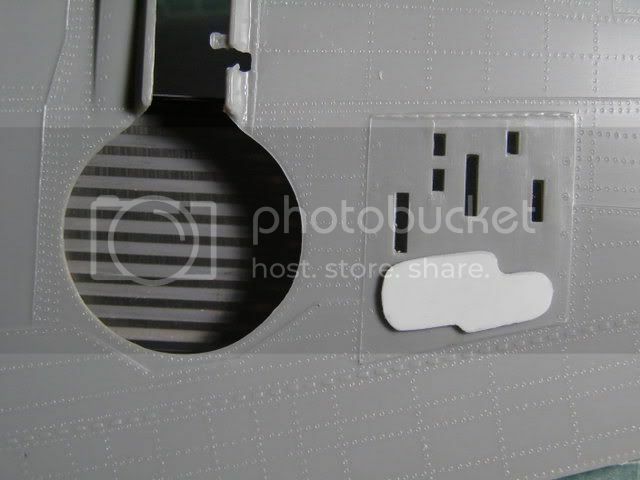 The kit featured hinged Ailerons and elevators. I did away with that option and narrowed up the gaps with styrene. 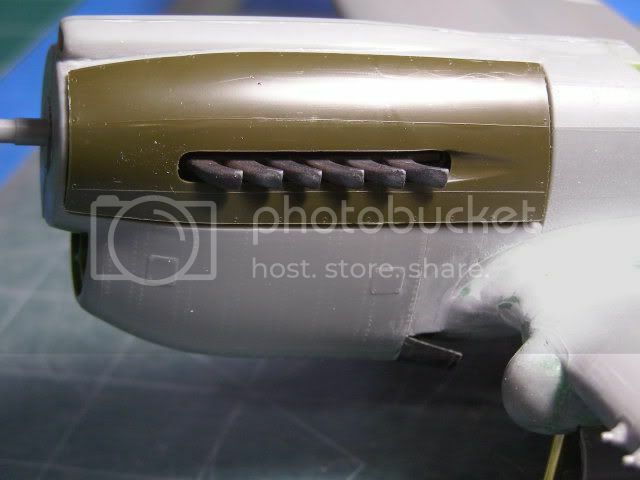 Left side Revell hinge , Right side no more hinge. I was not happy with the hinge setup or the gaps. Meet the players for the new Rudder hinge. Yeah It still works as It was really easy to do. Two pieces of Brass tubing sleeved together, Scrap piece of Music wire, and a leftover hinge from the "dreaded" Trumpeter Corsair. 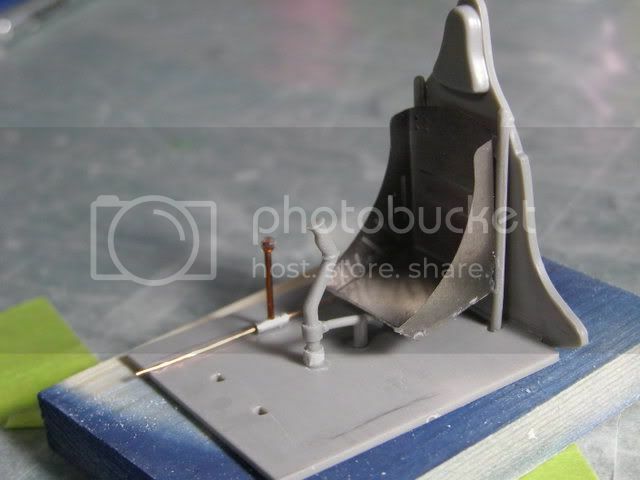 And the rudder attached. The control arm has been left off as I dont want to play the game of knocking it off and searching for it. Next time around landing gear. Wow, great job dressing this kit up! You're giving it the respect and attention it deserves. Great work! You are giving many ideas for my build. By the way are you considering using the kit supplied decals (I am considering painting the roundels and call letters since my decals are on the order of forty years old!) or aftermarket. Dang sweet improvements there, Summit. ...and your tutorial is top-drawer! Now this is getting good! Lots of great ideas shared here, top shelf work to boot! Keep those updates pouring in! It has been an absolute joy to watch this kit progress! You have raised the bar my friend! Looks simply amazing what you have accomplished! Could be the start of a whole new collection. LOL! Gotta love those P-40"s! 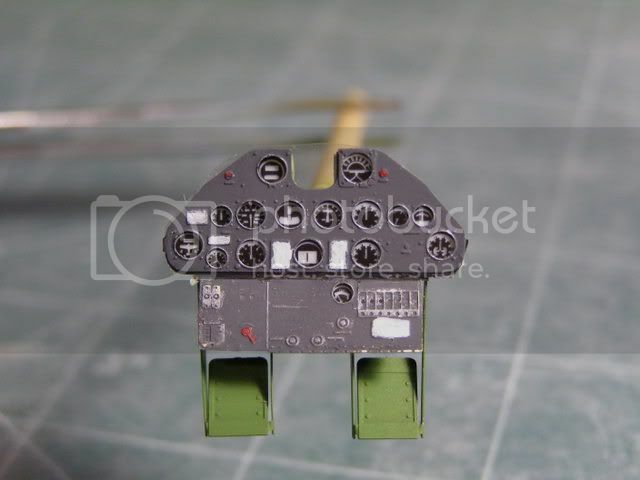 gspatton44 - I plan on only using the Roundels as they are made by Scale Master for Revell. I use decals that old all the time. Check them under a bright light for hairline cracks. If cracked spray them with a clear coat and you should be ok. pm me if you want more detail on this process. 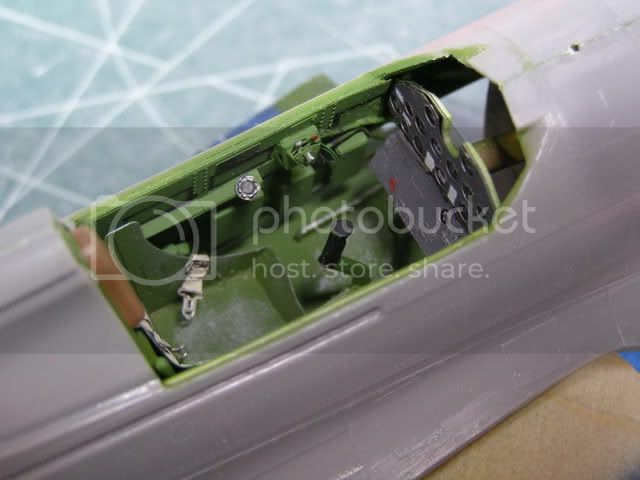 Frank - More pics coming up..
Revell supplies a pretty decent looking strut and inner wheel. Actually with a little work this has Great Pontential. I opted not to use this as I like to make more work for myself it seems. 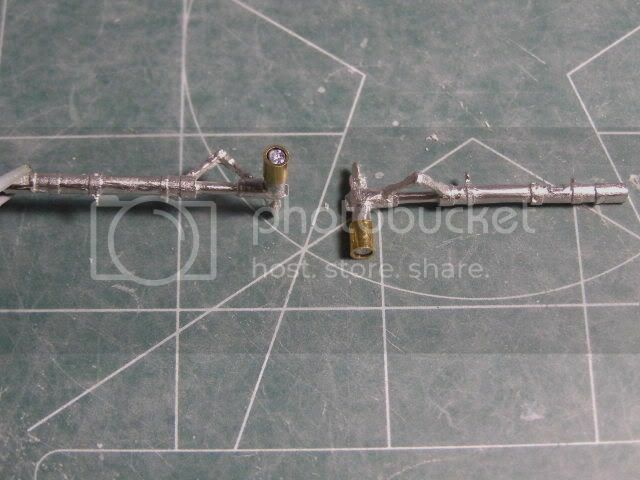 I found a set of white metal legs for the Trumpeter kit. Not what you would call a drop in replacement but with some modifacation they would work. The spindle was smaller then the kit supplied wheel so I made some bushings out of Brass tubing . And for the fun of it I wanted to shape the tires to a "loaded" look slightly flattened and bulged sidewalls. Since I had never done this before I got tips from a sfcmac on how to do this with a household Iron. Well that was just too much fun and I had really flat tires. With the help of Squadron Green Putty I was able to re~inflate them. 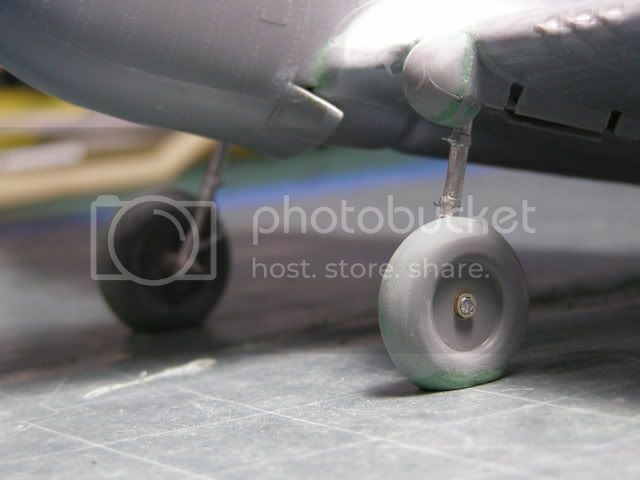 By not using the Revell Strut I had no inner wheel or brake drum. 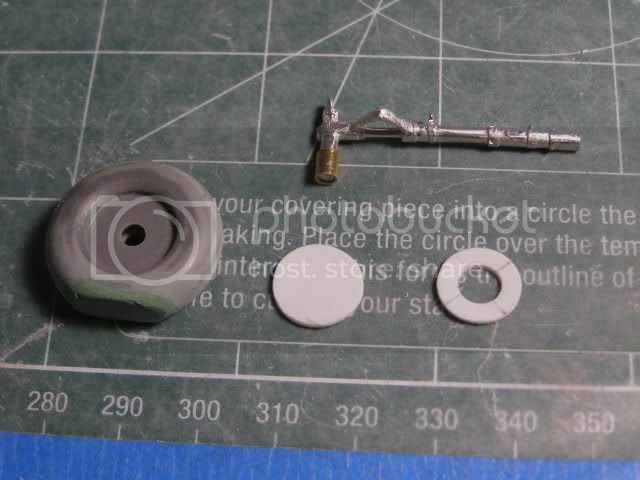 I cut out some styrene disk to replicate these items. The legs are fragile so they will be added as one of the last steps. 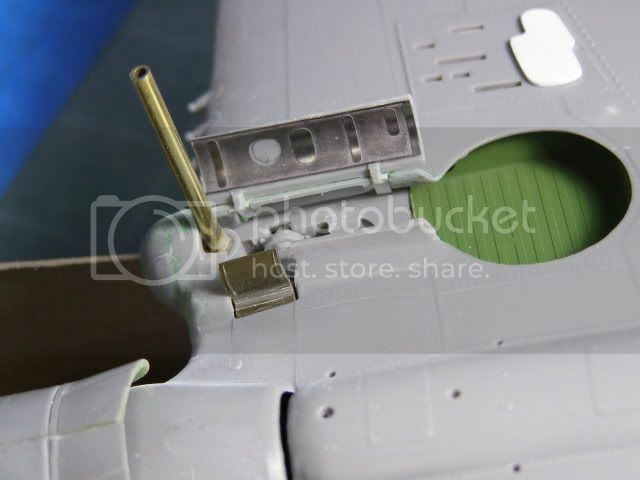 To keep the P-40 off its belly I cut two pieces of brass tubing held in place with some white glue. 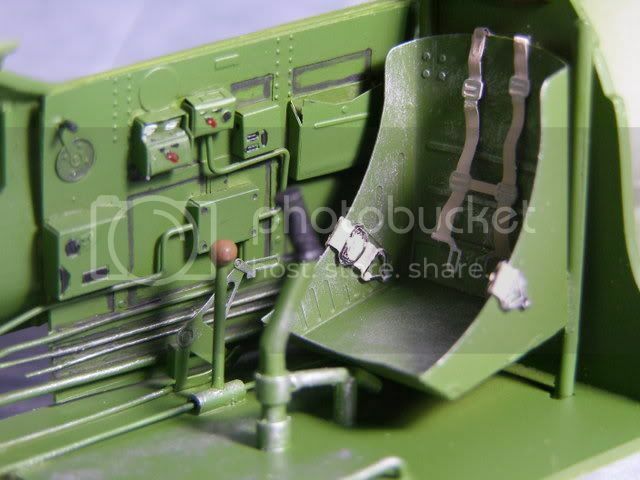 The kit featured working landing gear with opening doors. Again I did away with this option. 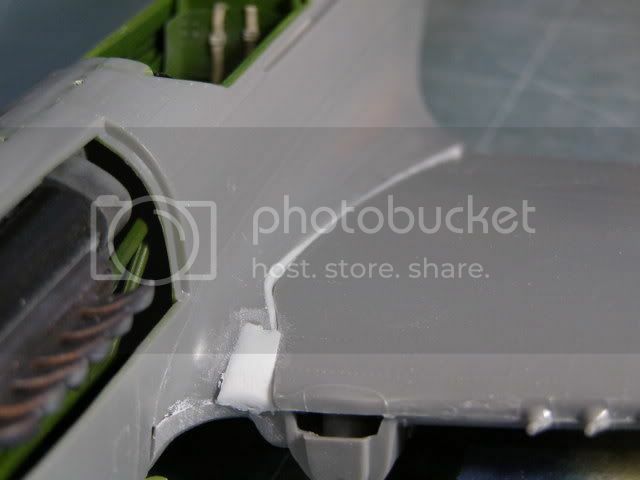 The hinge valleys were filled with styrene scraps and skimmed over with Green Putty. 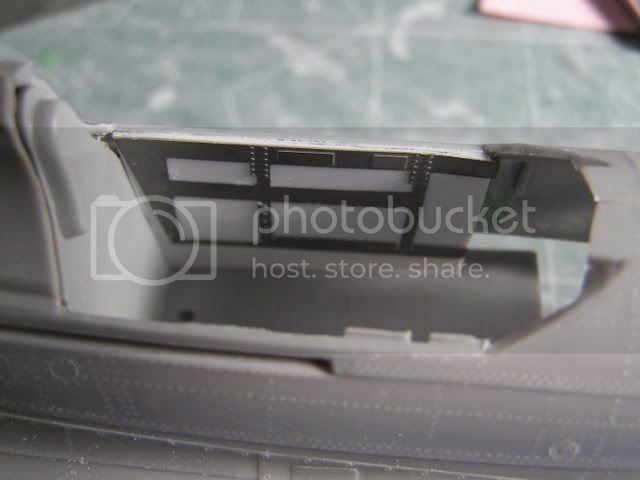 P/E inserts were added to the inner doors. 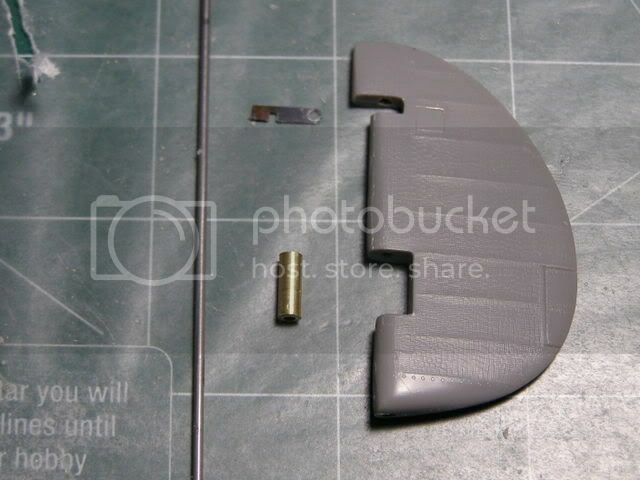 The tail gear was one of the crudest pieces with the kit. After looking at reference pics most of them had a canvas boot to keep out the grime. I found a piece of tissue paper and tacked it into place with some white glue. Once I was happy with the shape I used thin C/A to wick the tissue and make it solid. With a little trimming, the gear doors added and some paint problem solved. 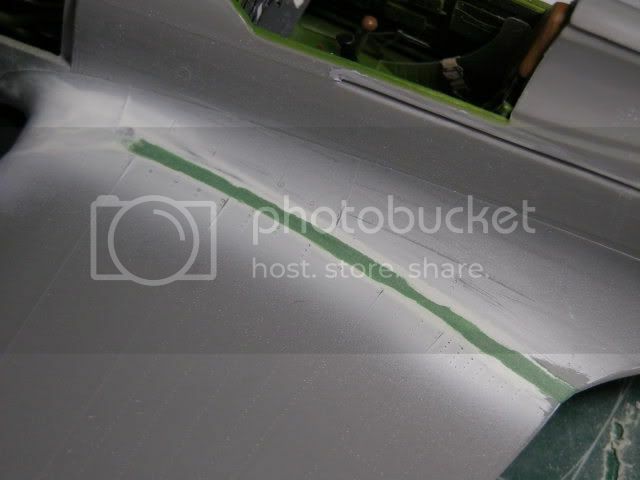 As you seen in the earlier pictures the Cowl Flaps are very crude. I had P/E replacements but was not sure about using them. Several days I would look at those flaps and chicken out. I finailly grabbed a razor saw and cut them off in one piece. (just in case) Well after I had the plastic flaps off I took the nippers to them and made plastic confeti out of them. No turning Back now. The P/E flap directions were vauge to say the least. But after the last of twelve pieces was in place I thought of a much easier method for assembling them. Oh well next time maybe.. This is awesome stuff! Great idea on the canvas boot, fixes a kit shortcoming, is cheap, and more scale to boot- doesn't get any better than that! 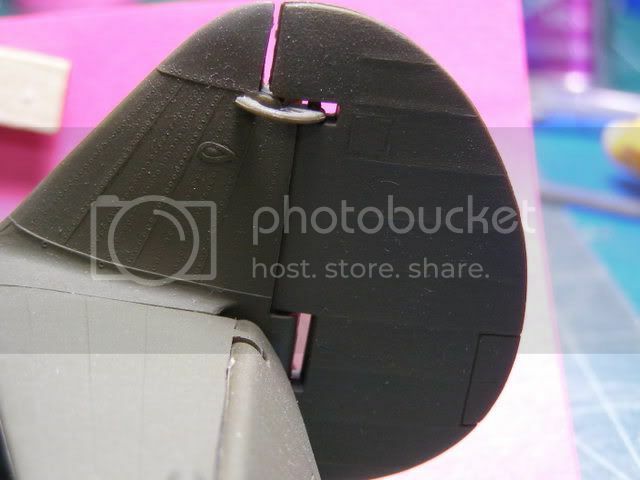 PE flaps look MUCH better than the others, and the LG is shaping up beautifully. I am really enjoying this thread! Wow, sean. That's some fine work there. Now that's what I call modeling! Roy - Thanks ! Go ahead and get one of these oldies. They sell pretty cheap on eb. They are just like a Time Machine taking you back to your youth. mucker - This has been a blast for me, much more fun then just assembling..
Steven - Thank you for Commenting, I have always enjoyed your work. 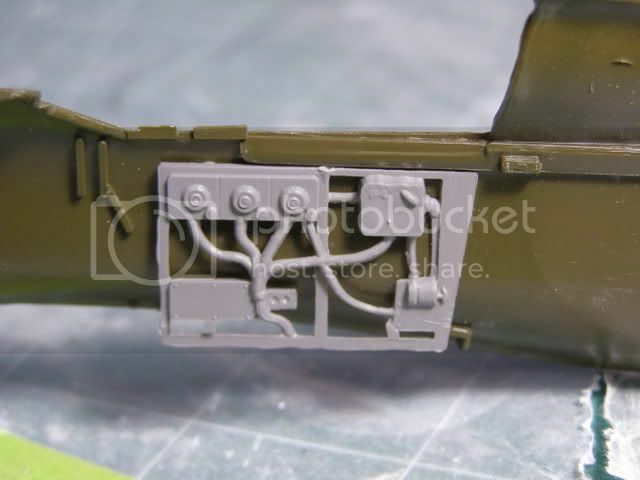 One of the things I really like about this P-40 is the removable engine panels. But finding a way to hold them in place has always been a challenge. 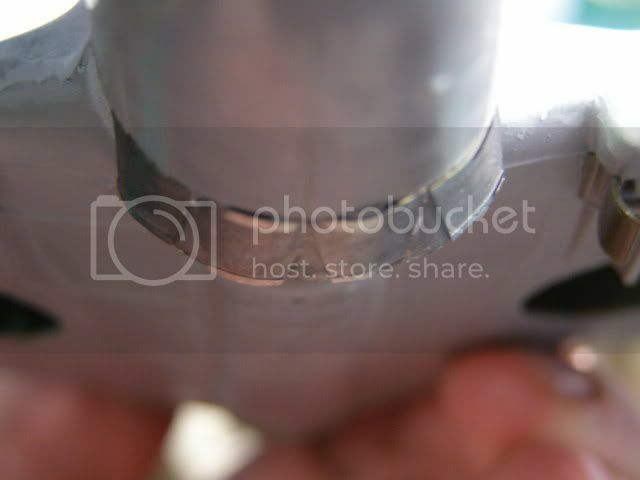 Small brass pins are fragile and get bent easily. I came up with this Idea yesterday and dove straight in. I had a leftover P/E fret from a Trumpeter kit. It is made of a stainless material I believe, not plated brass like many others. Using this and an advertising magnet of the Refrigerator I put this plan in motion. I cut a 2mm wide strip off the P/E fret to overlay the inner lip I thinned back with a flat file and a chisel bladed x-acto knife. 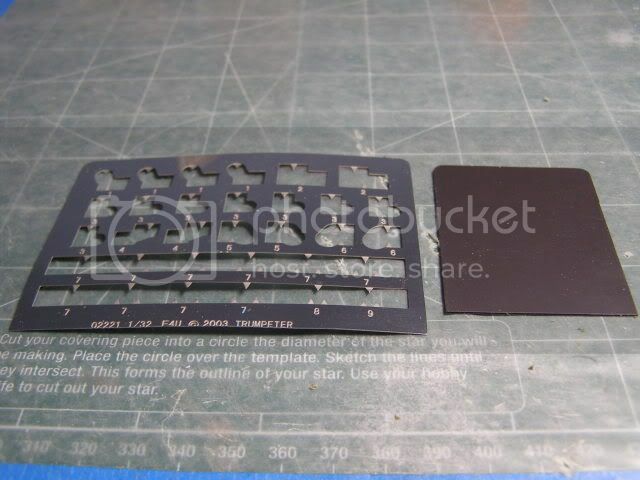 To make the inserts for the magnets I used a 3/32" drill bit. Placing a finger on the opposite side to feel for the dimple - did not want to go all the way through. I twisted the bit back and forth using my fingers with little pressure. When I felt the plactic bulge I stopped. I cut a strip off the Magnet and peeled the vinyl advertisment off. That still left a thin white backing. 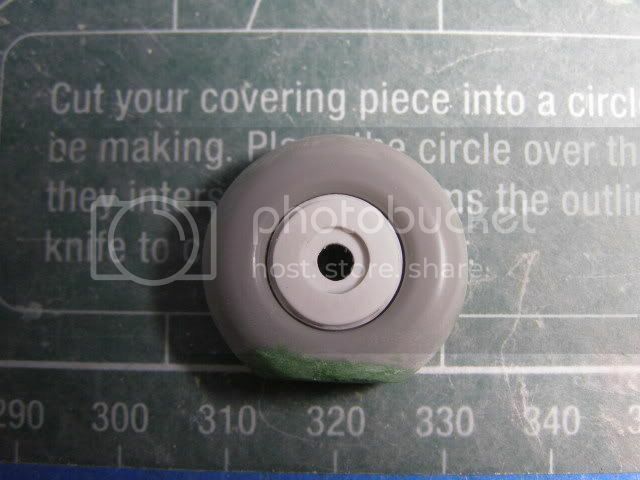 I used a small drop of C/A in the dimpled out area to attach the magnets. 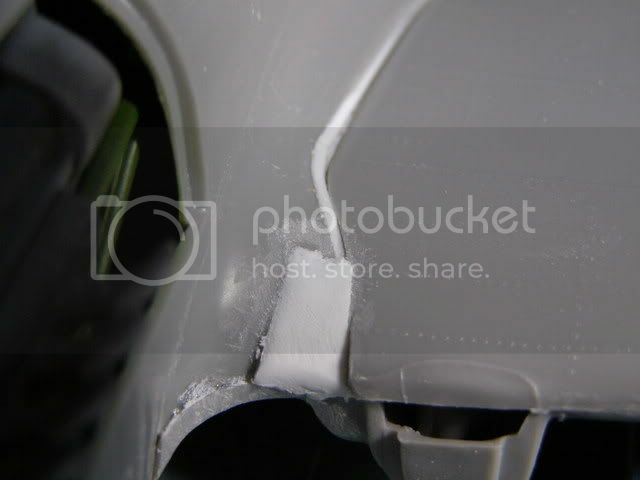 The green panel was a replacement robbed from another kit as the molded gray one was badly warped. And the End Results - Sticky enough to hold the Panel in Position. That is a brilliant solution Sean! An excellent improvision that I will have to use myself! What a great idea! You are really showing some unommon talent with that kind of innovation! Sean, great idea for the panels. Ah. That's the way. Good thinking! Nice work on the ol' girl so far. Looking forward to more pics. Well I must say I am getting ancy to see this one get some color! I really can't say enough praise on the excellent work you have put into it! Your enthusiasm in the build just adds so much to it and it's showing! Sean, can't believe how much work you are putting into this old girl! 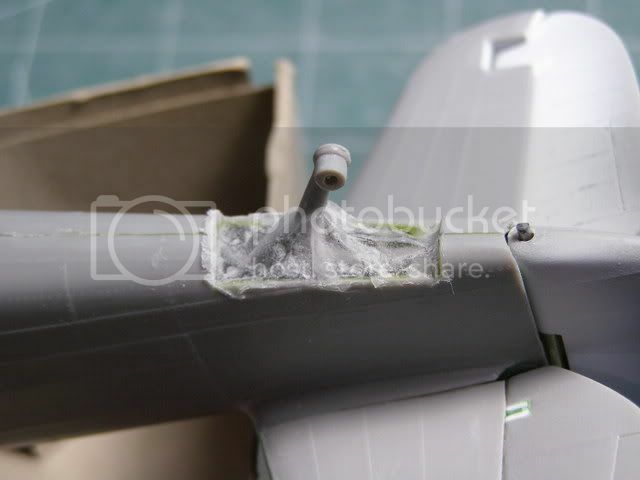 PE, scratch building, metal landing gear... I'm speechless (which is a first)!!! Forget Chucks stuff, we got Sean and Aaron whipping these old monsters marvels into shape. Sean, your attention to detail is fantastic my friend. You get a by, from homework for...err....3 days. cant be any more generous than that.